Celery has always been associated with lowering of blood pressure. When combined with other juices, it provides different formula that help other conditions. Recent studies have shown that celery might also be effective in combating cancer. Read on. Blood Pressure: Celery has organic sodium that actually reduces blood pressure rather than increases it. Drinking celery juice every day for a week significantly helps lower blood pressure. A compound called phtalides help relax the muscle around arteries, dilating the vessels and allowing blood to flow normally. To be effective, drink the juice for one week, stop for three weeks, and start over. Diabetes: Celery juice is an excellent drink for diabetics as it contains flavones (a type of antioxidant) that not only help to lower blood sugar levels, also prevent sugar spikes. 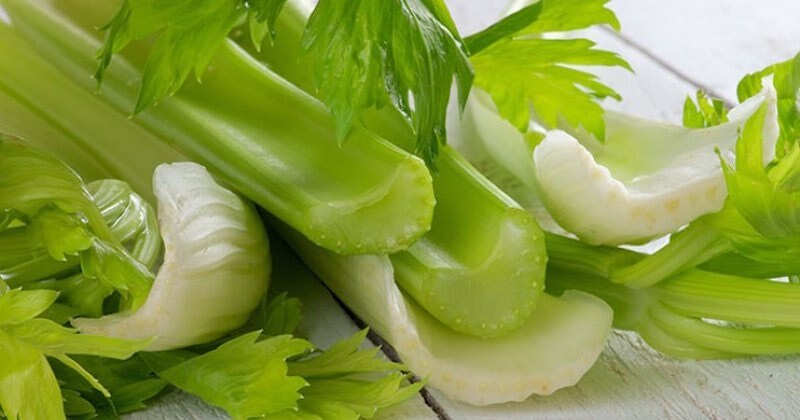 Inflammation: The polyacetylene in celery is an amazing relief for inflammation in rheumatoid arthritis, osteoarthritis, gout, asthma and bronchitis. 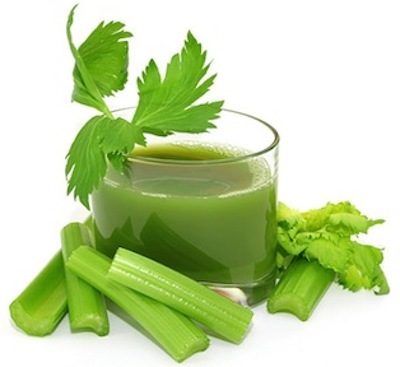 You can expect many more healing benefits from celery juice as you consume its natural sodium. Read how our body lacks and have been deprived of natural salt. For treating high blood pressure and other ailments mentioned above, drink one or two glasses of celery juice a day, morning and evening, at least 15 minutes before food. Celery is such a succulent plant that it produces its own “pesticide” to protect itself from fungi. This protective layer is called psoralen which although protects the celery, may not go down so well with some people. Some people with low blood pressure had complained that celery makes their blood pressure even lower. I personally didn’t encounter that problem so I believe it is also your overall make-up. But, you might want to avoid celery if you have low blood pressure. Listen to your body when you eat celery. I learnt new things about celery that I was not aware of until today! Thanks for the very useful information posted here and I look forward for more health related topics. Hi, I recently our a nutribullet, being diabetic type 2 I asked my doctor if it was OK to use it has I needed to lose weight and get healthy. He said it was OK but to use more greens than fruit and avoid apples and bananas, he also said I could use a “tiny” amount of apple, now I am confused. The best and it cures everything. Thank God for this vegetable. I have had great results with taking celery juice to lower my high blood pressure. I received these results only after 3 days of drinking celery juice which I juiced myself along with an orange and/or lemon or lime. This was so good and as far as my blood pressure meds they have already been cut in half. I feel so good. I will do as the article suggest and finish the week juicing, then stay off of the celery juice for 3 weeks and then start again for a week. Thank you for this article. How much celery juice do you consume each day? One eight ounce glass? Two? Drinking only one glass of celery juice (of about 8 oz) can bring down high blood pressure considerably. If you have very high blood pressure, drinking more than a glass may work better for you. I was having some health issues. I heard about celery juice and have been drinking celery juice every morning for a month. My Dr was so impressed by my weight loss and lab results she asked what I was doing! I can’t prove if celery does work. However, I think it does. This is my 2nd week taking celery. I don’t make it as a drink but instead I eat it raw as normal including the leaves. Wow eating like a rabbit lol. Does it truly keep the kidneys working good because I use to go toilet a lot more than average but the last 2 days I’ve been only going a lot less than usual and I can pee a bit longer? It feels great not having those urges so I can go longer without peeing not sure if that’s a good sign. Perhaps celery does help the kidneys unless something is wrong with my kidney function? I don’t have any pain and I feel my joints in my ankle are kind of light. I don’t feel heavy anymore in my ankles and sometimes popping noises similar to popping knuckles that click. I don’t hear the clicking. Amazing! I recently had a gout attack and sometimes get it once in a blue moon which is obviously caused from drinking alcohol now and then. The diet definitely works I use to eat a lot of sweets and now I feel I don’t have those cravings anymore. So if my body is proof then I feel confident to say celery is working for me so far. Another symptom I have is mucus in my nose or sinuses which is caused by either fungi or virus? I’ve had this symptom for more than 2yrs now. But the last few days I don’t have that heavy mucus in my nose anymore. It feels dry and I can breathe in and out of nostrils which I haven’t had since it first started. What do you guys think, am I proof that celery works or is my body feeling strange? Might get a check up from the doctor to be safe. I will post back once I’ve done my 3rd week of eating celery and see if there is further improvement in my body. Hi Mike, all that you’re sharing here are proofs that eating celery is working very well for you! Not having pee urges as frequently as before is a good sign that your kidneys are functioning better! And celery is definitely beneficial for reducing pain in joints and gout. I’m glad too, that it is also helping to reduce your sinus problem, that’s due to the organic sodium in celery that breaks down the mucus. Thanks for sharing!! I have been eating/drinking celery daily for about 7 years, using my Nutribullet to produce a thick drink. The mixture contains about 6 sticks of celery, 1/4 apple, 1/2 a carrot, ginger, Tumeric, ground black pepper to help the Tumeric, all juiced with plain coconut water. During this time the pain from my extreme arthritis has reduced to almost nothing. The cardio specialist says my heart rate is of a 40 yo (I am 78) I have an extremely degenerated lower back which while not perfect, gives little pain and allows me to walk about 2 klm and perform detailed stretching exercises daily. I was diagnosed with a prostate tumor about 5 years ago and now they say they can’t find it. I don’t know what the celery factor is in all of the above, but I know that I will not stop the daily process that I follow. Hi Sue, for reducing high blood pressure, you can drink one or two glasses of celery juice. I have updated the article above to include a juice recipe that you can use. Happy juicing!